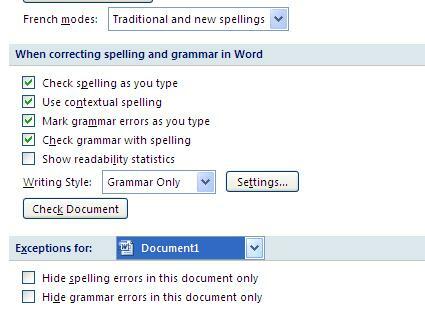 Spelling checking feature in Microsoft Word is great for those that are rushing for collateral completion and without the need to manually go through all the spelling errors, the built in feature can help to filter and display those errors for further correction. However, not all users prefer to have such features turned on all the time especially when you are mainly documenting programming scripts. Not to worry, there is actually a way for you to disable so that there won’t appear to be too annoying with all words underlined in red unnecessarily. Launch Microsoft Word. On the menu, click on Office button (in Word 2007) or File button (in Word 2010), then go to Word Options (at the bottom right corner). A new window will pop up and under the left pane, select ‘Proofing’, click on it. Scroll down to the ‘Exceptions for’ and over here, users can define if to apply the feature to only this specific document or to all documents. Once selected, go to check Hide spelling or grammar errors in this document only. By now, you should able to remove all the ‘red lines’ but do remember to enable it back (if you choose to apply for all new documents) for proof reading and error corrections.